Although most Western Balkan states began their economic transition from similar initial conditions as sub-national units within the former Yugoslavia, they have subsequently developed their welfare systems in quite different directions. In contrast, Albania started its transition from a diametrically opposed position as a highly centralised command economy. In developing new post-communist welfare states, the circumstances of transition and post-conflict reconstruction have led to varied welfare regimes based on a mix of legacies of the past, domestic policy choices and institutional borrowings from experiences in other countries. This chapter builds on the literature on the political economy of transition which identifies reform resistance from both losers and winners from transition and on the literature on different “worlds of welfare”, to identify the driving forces behind the different patterns of welfare provision which have emerged in the Western Balkans. Understanding the drivers of welfare state reform and the sources of reform resistance can inform realistic strategies to improve the effectiveness of social protection policies. 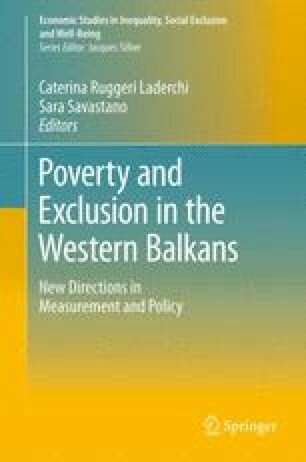 This chapter develops these ideas using data gathered from documentary sources and recent field research carried out by the author involving interviews with policymakers and practitioners in all the Western Balkan countries, covering different aspects of welfare including social assistance, pensions and health service reforms.